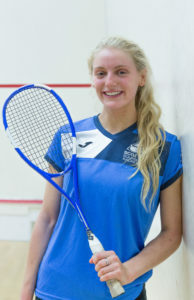 Carrie Hallam says she is relishing the prospect of donning Scotland colours again next week after being selected to compete at the WSF World Doubles Squash Championships in Manchester. 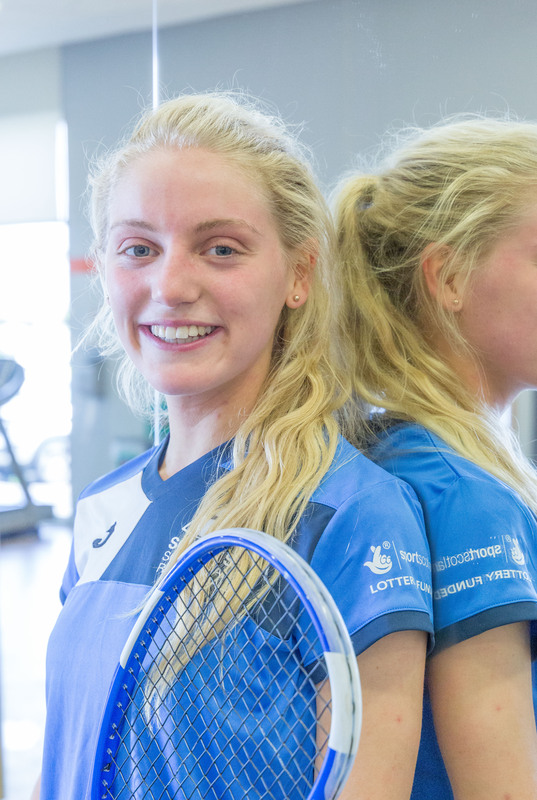 The 19-year-old will team up with Scotland’s number one female singles player Lisa Aitken in the women’s event and Chris Leiper in the mixed doubles. Earlier this season Hallam reduced her training schedule to focus on her degree at Edinburgh University where she is studying Neuroscience. 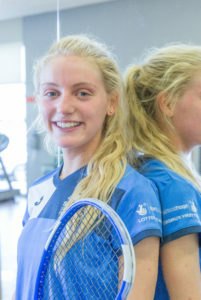 But the former Mary Erskine pupil has been back training hard on the doubles courts in recent weeks and has been rewarded with a place in the Scotland squad which will compete at the National Squash Centre in Manchester between August 1st and 5th. She said: “I’m really looking forward to heading down to Manchester. “I have always enjoyed playing doubles and it’s great being back on court. “I love the team aspect that you don’t get with singles and the attacking nature of doubles. “It’s so fast paced and the pressure of having someone else on court you don’t want to let down just adds to the heat of the moment feeling. 12th seeds Carrie Hallam and Lisa Aitken have been drawn in Pool D of the women’s event alongside two English pairings Laura Massaro and Sarah-Jane Perry (4) and Jenny Duncalf and Alison Waters (5) as well as South African 13th seeds Cheyna Tucker & Alexandra Fuller. “It will be tough but I couldn’t ask for a better partner,” Hallam added. “I love playing with Lisa. “It’s great having someone with so much experience on court with you and when you play with Lisa you don’t want to let her down. “She is so good at communicating, just knowing when to speak to you in between rallies and she reads me and opponents really well. In the men’s event Alan Clyne and Greg Lobban will be defending their world crown whilst Kevin Moran and Doug Kempsell will look to make inroads after landing the Scottish Men’s Doubles title earlier this month. 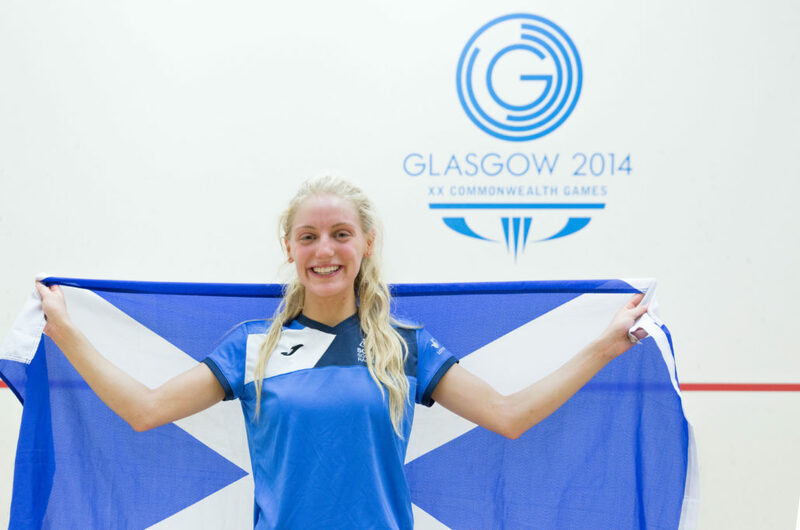 Kempsell will also team up with Lisa Aitken in the mixed event. Pool A:  Joelle King & Amanda Landers-Murphy (NZL);  Samantha Cornett & Nikki Todd (CAN);  Natalie Grinham & Milou van der Heijden (NED). Pool B:  Joshna Chinappa & Dipika Pallikal (IND);  Tesni Evans & Deon Saffery (WAL);  Catalina Pelaez & Laura Tovar (COL). Pool C:  Rachael Grinham & Donna Urquhart (AUS);  Rachel Arnold & Nicol David (MAS);  Sarah Cardwell & Tamika Saxby (AUS). Pool D:  Laura Massaro & Sarah-Jane Perry (ENG);  Jenny Duncalf & Alison Waters (ENG);  Lisa Aitken & Carrie Hallam (SCO);  Cheyna Tucker & Alexandra Fuller (RSA). Pool A:  Alan Clyne & Greg Lobban (SCO),  Nafiizwan Adnan & Ivan Yuen (MAS),  Harinder Pal Singh Sandhu & Mahesh Mangaonkar (IND); [13/16] Dylan Bennett & Piedro Schweertman (NED). Pool B:  Ryan Cuskelly & Cameron Pilley (AUS);  Peter Creed & Joel Makin (WAL),  Evan Williams & Lance Beddoes (NZL); [13/16] Christo Potgieter & Jean-Pierre Brits (RSA). Pool C:  Zac Alexander & David Palmer (AUS);  Tom Richards & Daryl Selby (ENG);  Andrés Herrera & Juan Camilo Vargas (COL); [13/16] Mohd Syafiq Kamal & Eain Yow Ng (MAS). Pool D:  Paul Coll & Campbell Grayson (NZL);  Declan James & James Willstrop (ENG);  Doug Kempsell & Kevin Moran (SCO); [13/16] David Baillargeon & Shawn Delierre (CAN);  Richard Larsson & Martin Andresen (NOR). Pool A:  Joelle King & Paul Coll (NZL);  Victoria Lust & Adrian Waller (ENG);  Deon Saffery & Joel Makin (WAL); [13/16] Lisa Aitken & Doug Kempsell (SCO); [17/20] Milnay Louw & Christo Potgieter (RSA). Pool B:  Dipika Pallikal & Saurav Ghosal (IND);  Tesni Evans & Peter Creed (WAL);  Samantha Cornett & Shawn Delierre (CAN); [13/16] Rachel Arnold & Mohd Syafiq Kamal (MAS); [17/20] Milou van der Heijden & Dylan Bennett (NED). Pool C:  Donna Urquhart & Cameron Pilley (AUS);  Joshna Chinappa & Vikram Malhotra (IND);  Amanda Landers-Murphy & Zac Millar (NZL); [13/16] Catalina Pelaez & Andrés Herrera (COL); [17/20] Carrie Hallam & Chris Leiper (SCO). Pool D:  Rachael Grinham & David Palmer (AUS);  Alison Waters & Daryl Selby (ENG);  Natalie Grinham & Piedro Schweertman (NED); [13/16] Nikki Todd & David Baillargeon (CAN); [17/20] Laura Tovar & Juan Camilo Vargas (COL).